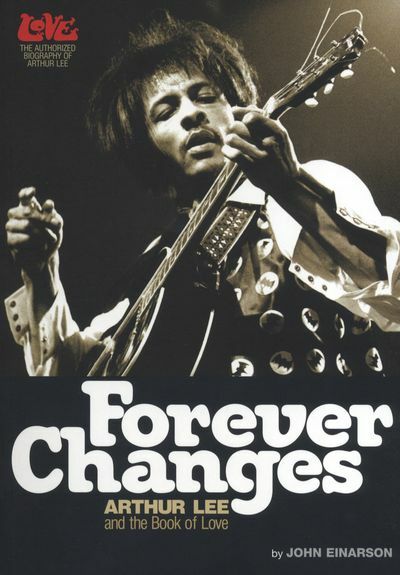 It’s a LOVE weekend at two L.A.book stores next Friday, July 9 and Saturday, July 10 in honor of the debut of John Einarson’s book “Forever Changes,” which features Arthur Lee’s autobiographical notes released for the first time! Friday July 9 at 7 p.m., STORIES Books * Cafe * Goods (1716 Sunset Boulevard, Echo Park) will feature a LOVE DJ night featuring mid-’60s L.A. scene discs spun by people who are huge fans of LOVE, including Lee Joseph, Tita Ortega, Ian Marshall, Kara Wright, Steve Stanley & Cheryl, Domenic Priore, Becky Ebenkamp, Renee Hendrie, Erik Bluhm, Kari French and surprise drop-ins. Every few songs, you’ll hear one by LOVE. Saturday’s event at BOOK SOUP (5 p.m., 8818 Sunset Strip) promises to be a legendary moment in the history of the band as LOVE guitarist Johny Echols and drummer Michael Stuart-Ware will be joined by ’60s Elektra Records president Jac Holzman and other close associates of Arthur Lee in an interview-question and answer session featuring “Forever Changes” author John Einarson, moderated by Domenic Priore (author of “Riot on Sunset Strip: Rock ‘n’ Roll’s Last Stand in Hollywood,” foreword by Arthur Lee). Live acoustic music will be provided by members of Baby Lemonade, who spent the last bunch of years touring with Arthur around the globe.